Enter Xiaomi. The Chinese electronics maker took its first steps into the smart surveillance market in India with its Mi Home Security Camera 360 Degree back in September last year. A few months later, in February 2019, the company brought a more basic version of the security camera to India. Aptly called the Mi Home Security Camera Basic, the device is sleeker than the Mi Home 360. It’s also cheaper at Rs 1,999 compared to Rs 2,699 for the 360 degree rotatable variant. Does the Mi Home Basic’s cheaper price tag mean compromises on features and surveillance quality? Let’s see how the two cameras compare. The Mi Home Security Camera Basic is slimmer no doubt. It has the same matt White finish as the Mi Home 360 Degree camera, but has a smaller footprint. The camera head of the Mi Home Security Camera Basic is fixed on an adjustable stand. It does not rotate 360 degrees like its more expensive counterpart, but the stand can be adjusted and set to a preferred position where it will stay put during surveillance activity. You cannot adjust the position of the camera head remotely through the Mi Home app, like you can for the Mi Home Security Camera 360 Degree. This could seem like a disadvantage, but if you actually find a good corner in a room, with a clear line of sight overlooking the surveillance area, the 130 degree wide angle view on the Mi Home Basic is decent enough to keep an eye on the whole room. 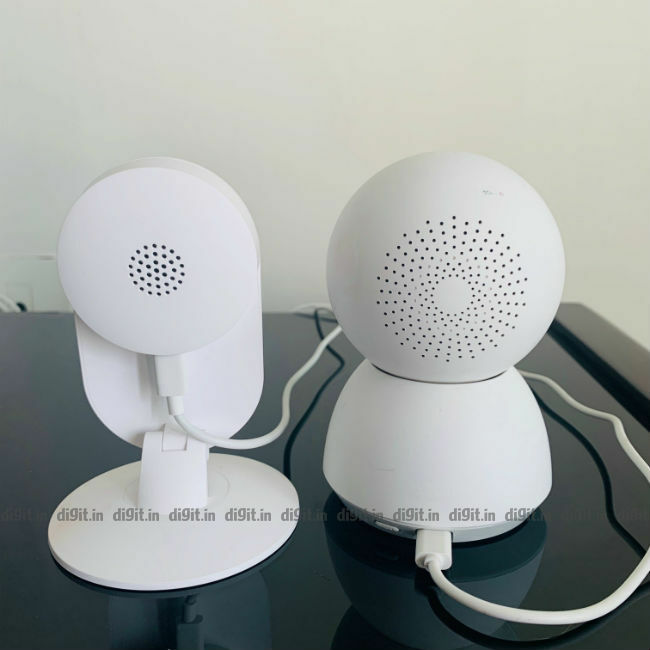 Then again, the 360 degree freedom of movement that the older, bulkier Mi Home Security Camera 360 provides is definitely an advantage over the basic version. In terms of design, the placement of ports and miroSD card slots differs in both cameras. There is no reset button on the basic Mi camera and instead, it gets a reset pinhole. In comparison, the 360 degree version sports a tiny reset button. Resetting the cameras readies them for a new setup. This is useful if you are moving the cameras to a different location and setting them up with a new Wi-Fi network. Both cameras are wired and need to be plugged into a USB wall socket on one end and a micro USB port that attaches to the camera on the other. 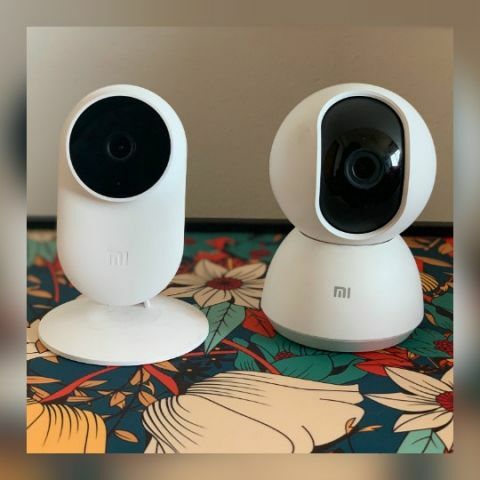 The setup process of both security cameras is identical, that is, you need to install the Mi Home app on your iOS or Android phones and follow the instructions on the app screen to setup the cameras. We’ve detailed the setup process of the Mi Home Security Camera 360 Degree in the video below and you can follow the same steps to setup the Basic version too. Once setup, you can forget about the cameras. They don’t need to be synced with the app again and again, unless you switch Wi-Fi passwords. Some amount of upkeep is required in terms of cleaning because the camera bodies are white and prone to dust accumulation. Dirty fingerprints can also spoil the looks of the cameras but they’re easy to clean. A microfiber cloth and some display cleaning solution does the trick for me. You can also use a regular soft cloth or good ol’ Colin spray. From the table above, it is clear that the Mi Home 360 and the Mi Home Basic are not too distinct in terms of features. 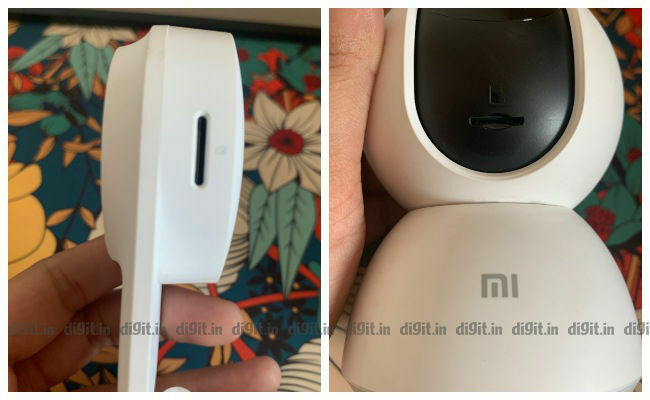 In fact, almost all the features you get on the more expensive Mi Home 360 are also present on the Mi Home Basic Security camera, with the exception of the field of view. In terms of performance too, the Basic version of Xiaomi’s security camera does an equally good job as its 360 degree counterpart. The picture quality at 1080p Full HD is clear, provided you are streaming the footage on your Mi Home app using a decent enough internet connection. Connectivity on the go, over cellular network, can be a bit troublesome and patchy. However, it should not hamper your experience too much. Even with a patchy network, your stream quality remains respectable. Obviously when there is no connectivity, you cannot stream the feed live. In this case, a microSD card or NAS storage could come in handy. The night vision on the Mi Home Basic works better than it does on the Mi Home 360. While monitoring my room one late night, I spotted an insect flying across the camera’s view while the room was pitch dark. Needless to say, I was pretty impressed with the camera’s low light capabilities, especially considering its price point. If the Mi Home 360 lost points on night vision, the in-built speaker that facilitates two-way communication is louder and more clear on the Mi Home 360. While I don’t really have any complaints about the speaker quality of the Mi Home Basic, I prefer the one on the Mi Home 360. If you think you can use these cameras for two-way communication as effectively as any of Amazon’s Echo devices, think again. While the speakers on the Mi Home Security Cameras do the required job of 2-way communication, the Echo speakers are much more capable with a longer range. If two-way audio is your only need, you’re better off with an Echo Dot. But if you want the picture with your audio, you’re better off buying one of the Mi Home cameras instead. Yeah, the Echo Spot does address the same problem, but it’s also pricier. The Mi Home app facilitates a host of other features on both the Basic and 360 degree security cameras. You can head here to read more about how to use the app and all the other features you can explore. One thing I would like to point out here is that you can use both cameras or a number of Mi Home cameras all with the same app. I use two of them in two different rooms and it’s easy to monitor both feeds from a single app. The only hitch here is that when you have two devices connected, initialising them one after the other takes a few extra seconds and is not as easy as tapping into one, tapping out and accessing the other. The biggest drawback of the Mi Home Security Camera Basic is that it is a wired solution, just like the Mi Home 360. It’s easy for someone to unplug the devices if they are placed within reach. These are not CCTV cameras that are internally wired. There are a number of smart home cameras available in India, some from known brands like Xiaomi and some from lesser known Chinese manufacturers. I also use a 360 degree camera made by a Chinese company called Yoosee and it costs almost the same as the Mi Home 360 degree camera, but the difference in user experience of both cameras is drastic. Xiaomi has a more evolved ecosystem, hence its app is more intuitive and feature rich. If I had to choose between the Basic and 360 degree cameras, my choice would only depend on my need. If I want the camera to rotate and show me the entire room, especially with reference to living rooms which are comparatively larger than bedrooms, I would go for the 360 degree camera. If I were to place a surveillance camera in a smaller storage room or a bedroom, the Basic version of the camera does a good enough job at a cheaper price.